And that’s the reason I love #AskGaryVee show so much. This show is basically a Q&A session between Gary and just about anyone, who will tweet him a question using #AskGaryVee hashtag. Free eBook: [content_upgrade id=5271]15 YouTube Channels That Make You Smarter[/content_upgrade]! And this is truly an amazing chance to learn from Gary, who’s undoubtedly one of the smartest marketers in the world. What goes below is a selection of my favourite quotes and takeaways from this show. I made some of the quotes “tweetable” in case you would like to post them on Twitter. Sometimes I would throw some of my own comments, if I feel that context is required; and sometimes I would embed the actual video, if I think that you ABSOLUTELY have to watch it. By no means this article is designed to replace those 50 episodes of the show. This is rather a “trailer”, that should motivate you to go watch all of the past episodes. Subscribe to Gary Vee’s YouTube channel if you want to get notified of the new episodes (you can also subscribe with iTunes). “Do I know what my competition is doing? At some level. A little bit. Contextually. But I never go deep. It’s all “headline reading”. I know who’s making some buzz and some noise. But I truly believe, that the biggest mistake so many companies and entrepreneurs make is “looking around them”. Note from Tim: That was my own question to Gary and if you want to see how I look/speak – just check the video below. Actually the question about accents is relevant for many people, not just me. I even got a few emails from my readers (who considered me a US person) asking if I thought it was possible to tap into American market while leaving in Europe, Russia, India, Philippines etc. And I think that’s absolutely possible! Go watch a speech of an american idol, with terrible Austrian accent. Oh.. and I’m actually from Ukraine, not Russia. And this didn’t matter to me until some recent events. Note from Tim: No matter how good the tactic works for you right now, there’s always a decay. That is why you should innovate and try new things or you’re going to fall behind your competition. Note from Tim: Many people complain that they don’t have enough time to build their business and come up with tons of different excuses. Well, I loved Gary’s take on this so much, that I’m actually embedding this episode here. The rant starts at 4:37. Note from Tim: What Gary meant to say here is that if you’re this young – you should allow yourself to have a little more fun, you’ll have your chance to accomplish things as you get older (I guess a lot of people would love to argue that). Note from Tim: In case you didn’t click the link to watch the full video, I’m going to give you some context. Gary was talking about the automation of your Direct Messages on Twitter once someone follows you. Here’s the thing: there’s no way to make a good first impression with an automated message, especially if you’re trying to immediately sell them on something. Note from Tim: Gary seems to be a huge contradiction on this one. HERE he says that for the first 10 years of his professional career he “didn’t say a damn thing”. What he did was work, that allowed him “to have the audacity to build the Gary Vaynerchuk brand”. And HERE he says that he kinda regrets that he didn’t “map his journey” and suggests others to start producing content early in their careers. Both of these pieces of advice make perfect sense to me, but at the same time they seem contradictory, so I feel I’m missing something. Go to iTunes AppStore and look at the top 150 paid and free apps. Note from Tim: This strategy is obviously very relevant to Gary, being a public figure who’s famous enough to make people follow back and then read his tweets. But what about newbie bloggers? Do other people care about a random blogger who have followed them on Twitter? Well, if you refer to the famous 1% rule of the internet, the vast majority of people (99%) consume content, and only a few (1%) create it. If you’re a blogger, you’re one of a few, who is creating content. And your job is to get yourself in front of thousands of content consumers and make them interested in you. These people don’t get new Twitter followers too often, so they will likely check your Twitter profile once you follow them and if your profile is cool enough – you might get yourself a new follower. Note from Tim: I guess this kind of advice can’t be adopted by everyone, since only a handful of people can afford hiring someone to manage their time. But I’ve learned another thing from Gary – see Lesson #13. “Biggest piece of advice that I’m willing to give to sales people in this world is ironically “Jab, Jab, Jab, Right Hook”. The truth is – everybody is trying to close too early, it’s just lack of patience, it’s not providing value. Be tactical, but understand the “Religion”, which is: “Provide value upfront”. 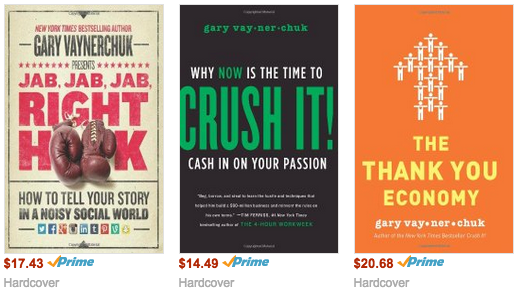 Want More of Gary Vaynerchuk? In case you’ve made it all the way to the bottom of this article, I guess you loved what Gary V. has to say and you want even more. 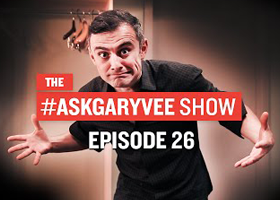 So did you ever stumble upon any of the episodes of the AskGaryVee Show? Can you share the most memorable lesson you’ve learned from Gary Vaynerchuk? GREAT list and thank you for sharing. Huge fan of Gary and I love his special style of podcasting (to name the least). Top notch and shared! #BOOM! I intend to meet this guy on Saturday at the Wine Store; it’s right by my hometown in NJ. So excited! I like to talk and it hasn’t hurt me. Just last week I spoke to a class at NYU bout blogging from paradise, and talking like mad helped me land the gig. Of course I promote others super freely too, to open doors for myself, as when you give, you get…..but overall, don’t fear talking, engaging, asking and answering questions, and promoting yourself to make things happen online. It can be a killer to get too caught up in what everyone else is doing…. Great Article Tim, love how you create your articles, do you mind if I will copy your style on my blog one day or another? Hahaha, just joking… or maybe not :D However. I had never heard about Gary before, thanx for sharing this amazing experience! Hey Andrea! You are free to copy my style, because it will be YOUR own copy :) The Beatles were copying others for a very long time, which helped them to find their unique voice!